Apple Cheese Danish Bars are a quick and easy dessert that is perfect any occasion! 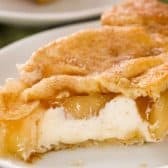 Sweetened cream cheese and apple pie filling layered between two sheets of crescent dough create a luscious treat that your family is sure to love! Roll out 1/2 of the crescent rolls onto the bottom of the dish. Blend the cream cheese in a medium bowl till very smooth. Add powdered sugar and vanilla and blend. Spoon cream cheese mixture onto the crescent rolls. Top with the apple pie filling and the last half of the crescent rolls. Pour melted butter over top and sprinkle with cinnamon sugar if using. Bake for 25 minutes. Cool and drizzle with glaze if desired. Combine all ingredients except milk in a small bowl. Mix well. Add milk until the glaze reaches desired consistency. (You may not need all of the milk). Drizzle over danish with a spoon.